Brand new Dial-A-Ranger and other updates! Brand new Dial-A-Ranger. As Stan’s story continues he has finally received a package, but is it the one he has been waiting for? Or something for more sinister? It was a fun episode to do as all of them are. 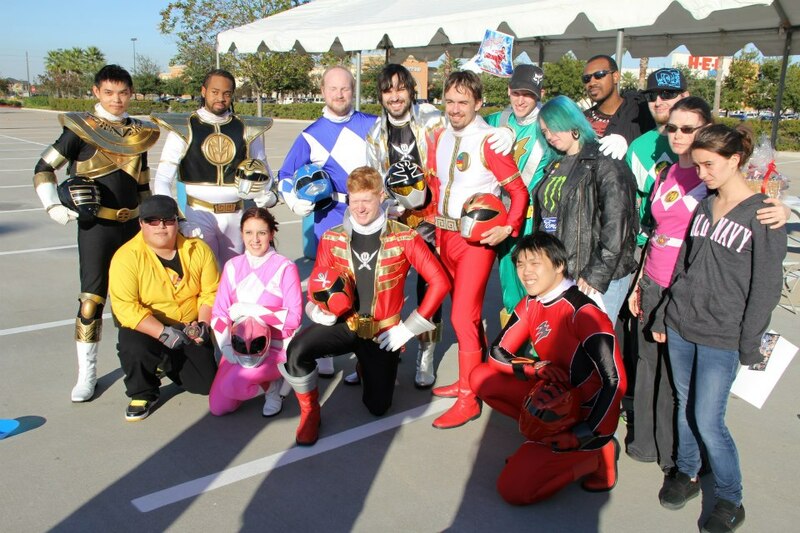 This past weekend Seth Jones (Stan) went to Houston along with several other Mighty Morphin Texas Rangers fan group members to be a part of the grand opening of a new dojo from Jason David Frank, legendary Power Rangers actor. Knowing that was coming up I took the opportunity to plot out a DAR episode that could incorporate other suited people and pulled some of the other Texas Rangers with video experience and gear into the mix. I knew it was going to be a unique challenge, coordinating something from far away, but from what I have been told, things went well. Big ups to Kevin and Carlos for making it happen. I am awaiting the footage from the guys. It takes place in a later episode, but I will probably start stitching it together as soon as I get it. On the Web site front, we switched to GoDaddy.com recently to have a more official site rather than just a blog but we are still having problems getting it published. The price of doing things yourself I suppose. We could pay someone to do it, yes, but that takes budget we don’t have and we can put up something fairly serviceable ourselves I like to think. I have put up several pages before, I am not sure what the hangup is with these guys. Danica Patrick commercials aside, I am not very happy so far with them. On the Insourcing front, we have a few shoots left as I have mentioned before, Thanksgiving and Christmas coming up kind of throws a monkey wrench into planned shoots given the holidays and people spending time with family or working overtime for that Christmas money and things like that. I am confident we will be able to eek out a shooting weekend sooner than later though. On the graphic novel front, we are waiting on samples against from another artist. Hoping things work out with someone soon. I will admit I did not think it would take this long to find an artist. I was hoping to have several pages done at this point in time, but I have to get the artist that will really work, or what is the point right? So patience will have to continue. Looking to get back to Cali still in March or so for a photoshoot with Annie Cruz as the title character and to set up a Kickstarter for the book and the film at some point in 2013. Arranging auditions for Party Girl continues. Having to move some things around due to some obligations both family and wrestling related that have popped up recently and need to be tended to. Still confident (aren’t we always) that things will get done and casted before January when I would like to begin shooting. Looking to jump up from the T3i we use to a 5D Mark ii. Sure the Mark iii is the shiny new toy, but the Mark ii can still be a workhorse that gets the job done and I’d sooner spend the cash on two Mark ii bodies and a new lens than one Mark iii and a kit lens. That’s just me. Continuing to be productive as we near the close of 2012 and looking to make 2013 very big and very successful in all Taurian Films projects.